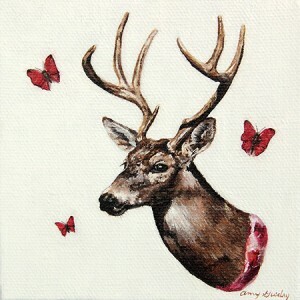 Amy Guidry, (born 1976, Jacksonville, N.C.), is an upcoming artist from Lafayette, Louisiana. 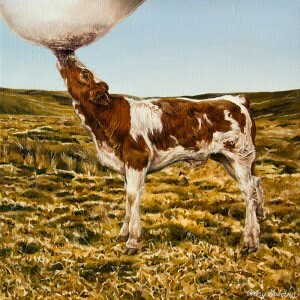 We like her surreal, very contemporary paintings showing animals and nature in a dreamy surroundings, sprinkling with an almost smart cruelty. That definitely makes you think about the pictures´ meanings. We ask ourself who did this to the animals, and what do they stand for. Guidry doesn´t answer to those questions in her images, but instead wants us to dive deeply into the phantastic worlds she is creating in her paintings, and thus find the answers ourselves. Amy Guidry (geb. 1976 in Jacksonville, N.C.) ist eine spannende Nachwuchskünstlerin aus Lafayette, Louisiana. Guidry beantwortet uns diese Frage nicht in ihren Werken, sondern will, dass wir tief in die fantastischen Welten eintauchen, die sie in ihnen schafft – und so die Antwort selber finden.